With her mother away in Scotland, eleven-year-old Isla lives alone with her father and the family dog on ten thousand acres of Texas fields and woods—and that’s the way she likes it. Though she seldom sees other people, all the animals of the forest are her trusted friends, and she speaks their languages almost better than her own. When a new family moves in near the property, Isla begins to appreciate the value and fun of having human friends, too. But even as Isla introduces her new friend, Cash, to the wild places she loves so much, life on the property begins to change in dangerous ways. Things are oddly out of place, and fires break out in the woods. Could it simply be the drought that’s to blame? Or is there something more calculated behind it all? In Isabella Allen’s exciting debut novel, Isla and Cash set out to find the truth and uncover a ruthless plot. 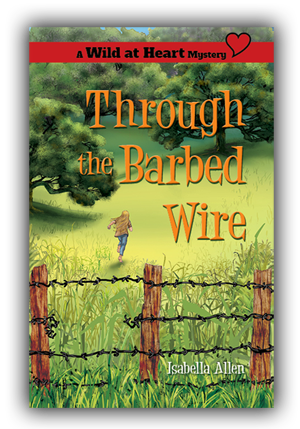 Discover what adventures await in Through the Barbed Wire, the first book in the Wild at Heart Mystery series! "In this debut novel intended to be the first in a series, Allen blends a love of nature and animals with a contemporary rural mystery. The novel is plot-driven and fast paced. A great read alike for Penny Warner’s Code Busters Club series." "Isla and Cash were great characters. They were exciting, and they seemed like people you would want to be friends with. Even though it was a fictional story, this book was filled with interesting facts and details about the animals and the overall experience of prairie living, which made for a very interesting read."